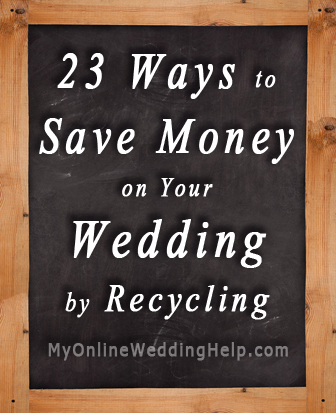 Savings secret #4 in Dream Wedding on a Dime; 7 Secrets for the Budget-Savvy Bride is “Recycling Saves More Than the Planet.” Choosing items you can use in everyday life, buying pre-owned, selling products, and donating to charities all help conserve our planet’s resources, plus have a positive impact on the bottom-line cost of your wedding. Choose items that can be used later in your day-to-day life. Sell your wedding products after the big day. Have unusual yet inexpensive presentation dishes such as pumpkin shells or shot glasses. Buy used imitation flowers, and resell them after the wedding to keep your costs low. Carry unique-to-you “flowers” by making the bouquets from buttons, brooches, or paper instead of flowers. Reset a stone or melt down your old jewelry. Choose accessories you can reuse in everyday life. Donate your wedding ensemble to a local charity that helps those who cannot afford a wedding. Let the groomsmen choose informal attire they can wear in everyday life, such as a mix and match of nice blue jeans, suspenders, and button-down shirts with jackets and ties. Pick nice-looking but inexpensive suits that are also appropriate as normal dress wear. Buy the groom’s suit or tuxedo pre-owned. Have the groomsmen wear their everyday dress suits and “oomph them up” with accessories. Buy new or used tablecloths and napkins online and resell them. The above is based on content from the ebook Dream Wedding on e Dime; 7 Secrets for the Budget-Savvy Bride.